We are skilled in many specialized areas enabling us to offer unmatched maternal-fetal care. Georgia Perinatal Consultants provides a complete array of services including routine obstetrical and gynecologic studies, consultation concerning fetal and maternal complications, genetic counseling, diagnostic ultrasounds, fetal monitoring & diagnosis, blood screening exams, and invasive testing. We provide routine specialized prenatal care including mothers who are 35 years of age or older, obese, carrying multiples, diabetes, hypertension, cervical insufficiency, heart disease, blood disorders, and autoimmune disorders. We are also specialists in treating fetus’ with genetic disorders, anatomical defects, anemia, growth anomalies or have been conceived through in-vitro fertilization (IVF). Follow the links below to find out more. Consultations are available for fetal conditions affecting development including birth defects such as cleft lip/ palate, club foot, neural tube defects, and Downs Syndrome. In addition, consultations are available for special care pregnancies. These include those pregnancies complicated by hypertension, diabetes, pre-term labor, recurrent preterm delivery, recurrent loss, anemia, and autoimmune disease. Before pregnancy, we can provide advice for women with chronic health conditions. We also consult with women who have experienced maternal or fetal complications in previous pregnancies. Our goal is to establish a management plan that will result in a healthy outcome for both mother and child. We work with obstetricians and other health care providers to ensure high quality care during labor and childbirth. We provide expert advice on when to induce labor and communicate with medical providers on how to care for mothers and/or babies with specific medical conditions. We also work with your obstetrician to manage intrapartum obstetric complications such as preterm labor, hemorrhage and hypertension. MFM specialists are experts in diagnostic ultrasound and play an important role in screening for fetal chromosome abnormalities and birth defects. Our perinatologists provide expert consultations for families who have learned of a birth defect and work with their obstetrician, genetic counselor and pediatric surgeons to determine the best plan of care for mother and fetus. It is important to note that not all birth defects can be identified while you are pregnant. This ultrasound exam is ideally performed in the first trimester . At this time, we establish a due date and determine if the pregnancy is growing properly within your uterus. We also evaluate for multiples and check to see if your ovaries are healthy. This ultrasound examination is time sensitive and must be performed between 11 and 14 week’s gestation. A measurement of the lymphatic fluid at the back of the baby’s neck is obtained. The presence or absence of the fetal nasal bone is also documented (absent nasal bone may be associated with an increased risk for chromosomal abnormalities). The results are combined with your age and a special blood test to determine if your pregnancy is at increased risk for certain chromosomal abnormalities. This ultrasound can also detect whether or not your baby is at an increased risk for heart abnormalities. This exam should be performed by a certified medical provider. At Georgia Perinatal, all of our sonographers and physicians are Nuchal Translucency and Nasal Bone certified. We also offer cell-free DNA testing. This ultrasound is most often performed between 14 and 16 weeks. Your baby’s anatomy is evaluated for possible birth defects. This ultrasound is most often performed between 20 and 22 weeks because most features of your baby’s anatomy can be better visualized at this time. During this ultrasound, your baby is literally checked from head to toe and all of the baby’s organs and anatomy are evaluated for structural and genetic defects. A growth ultrasound is performed to determine an estimated weight of your baby. Some patients have a medical condition necessitating that the doctor monitor the baby’s weight throughout the course of the pregnancy. It is important to note that this weight is an “estimate” and actual birth weight and estimated fetal weight can differ. This exam is also performed to evaluate the cause of growth disturbances which may include infection, placenta insufficiency, and chromosomal or genetic disorders. 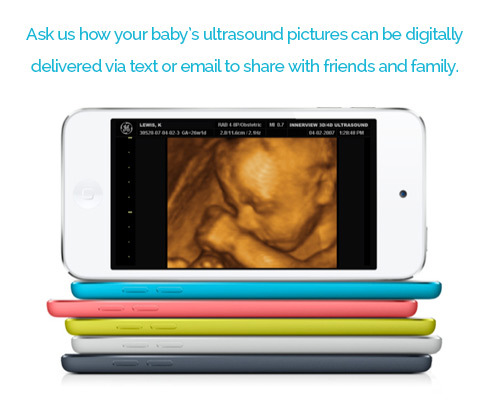 This ultrasound examination is used to assess the health of your baby. Movement, tone, breathing and amniotic fluid volume are checked to help determine the well-being of your baby inside your uterus. 3D/4D ultrasound may be utilized to visualize certain anatomical parts and rule out birth defects. Doppler ultrasound is a specialized exam that allows physicians to measure blood flow through the umbilical cord, fetal brain and heart. These tests help determine whether the fetus is getting enough oxygen and nutrients, or if it might be better off born. A cervical length ultrasound measures the length or your cervix. You made need this test if you are having symptoms of preterm labor such as contractions or pressure or if you have a previous history of preterm labor and or preterm delivery. We also routinely check the cervix if you are pregnant with multiples. Transvaginal ultrasound may be used to identify the location of your placenta. We may perform this test if you have a history of vaginal bleeding or if your placenta looks like it may be near your cervix. This is a special ultrasound of the baby’s heart. This test may be required if you have a family history of congenital heart defects, have certain medical conditions or have undergone IVF treatment. Using ultrasound, we can estimate whether a baby has too little fluid (oligohydramnios) or too much (polyhydramnios). Both too much and too little fluid can be associated with chromosome issues or poor obstetrical outcomes. Patients with abnormal amniotic fluid levels are monitored closely and adjustments with your due date are communicated to your obstetrician. The more babies you carry, the more your risk increases for complications including early labor, growth restriction and chromosomal issues. In some cases, babies share a single placenta, which can lead to uneven blood flow causing twin-twin transfusion syndrome. If you are pregnancy with multiples you will receive more frequent care to properly manage your pregnancy. A NST observes the baby’s heart rate while the baby moves. Two monitors are placed on your abdomen. One will record the baby’s movements and/or uterine contractions, while the other records the baby’s heart rate. Fetal activity with a rise in the baby’s heart rate is a good indication of fetal well-being. This test usually takes 30 minutes to complete. Genetic counseling helps patients understand the medical, psychological and familial impact of genetic disease. We interpret family and medical histories to assess the chance of disease occurring or recurring. We educate about genetic resources and research, which helps to promote informed choices. A Genetic Counselor (GC) is a health care professional with a master’s degree in human genetics and counseling. Georgia Perinatal Consultants’ GC’s are employees of Northside Hospital and are board certified by the American Board of Genetic Counseling. Genetic Counseling is a service that helps you understand information about your pregnancy and prenatal care testing options. During your visit, the GC will review your relevant medical history and any genetic testing you and your relative have had. The GC will evaluate this information to determine if you are at risk for having a child affected with a birth defect or genetic condition. You will leave this appointment informed and ready to make the best decisions for you and your family. Cell-free fetal DNA is blood test sampled by venipuncture on the mother. The blood is sampled for pregnancy derived DNA circulating freely in the maternal blood stream. Analysis of the blood sample has been proven to be a highly sensitive exam for fetal aneuploidy. Georgia Perinatal Consultants was the first in Atlanta to to pioneer cell-free DNA testing. Who Should Consider Prenatal Genetic Counseling? A woman who will be 35 years old or older when her baby is born. Anyone with abnormal results from a genetic screening or diagnostic test. Anyone with a family history of an inherited disorder, birth defect or mental retardation. Anyone who has questions about a disease or a condition that runs in the family. Anyone concerned that his or her job, lifestyle or medical history may pose a risk to pregnancy (including exposure to infection, medicines, alcohol, street drugs, chemicals, or other environmental agents). Couples who are first cousins or other close blood relatives. A woman who has had two or more unexplained miscarriages or early infant deaths. Couples with infertility thought to have a genetic cause. Men with congenital bilateral absence of the vas deferens (CBAVD). Prenatal Invasive Procedures should be performed by a perinatologist to minimize risk to your pregnancy. Invasive procedures are beneficial in there ability to provide detailed information about a pregnancy; this information might aid in your care moving forward. Other procedures help prolong a pregnancy preventing health consequences of premature birth. Guided by ultrasound, the Perinatologist inserts a small needle through the uterus into the sac to collect a small amount of amniotic fluid. We use this fluid to test for genetic diseases, fetal lung maturity, or infection. In some cases, a pregnancy presents with too much amniotic fluid (polyhydramnios). To reduce the risk of early birth and to treat certain fetal diseases the Perinatologist might perform a therapeutic amniocentesis. Guided by ultrasound, the MFM places a needle in the uterus and draws out amniotic fluid through a syringe. Guided by ultrasound, an MFM can insert a needle into the umbilical cord to collect a fetal blood sample to diagnosis certain diseases. In cases of fetal bladder outlet obstruction, in-utero surgery is performed by placing a a stent inside the fetal bladder to correct and preserve renal function. This procedure is performed with ultrasound guidance to ensure the well-being of the baby inside the womb. Guided by ultrasound, the Perinatologist inserts a needle into the umbilical cord and transfuses blood to a baby while it’s still inside the womb. This is done in an effort to treat severe fetal anemia. In simple terms, a cerclage is a stitch that strengthens your cervix to prevent pregnancy loss or preterm labor.